and or bidding assistance, any one of our family or capable staff are here to help you. Buyer Representatives Connor Creech Cell: 780-871-8496 Connor is very familiar with all the bulls... he can help out if you have questions. 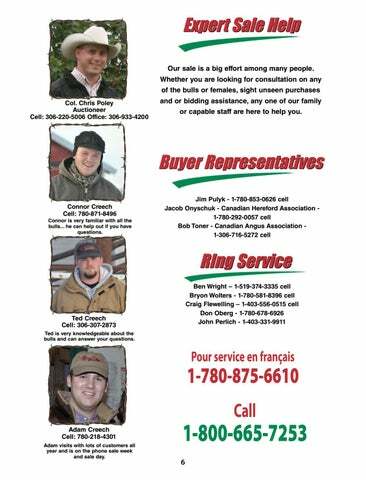 Ted Creech Cell: 306-307-2873 Ted is very knowledgeable about the bulls and can answer your questions. Adam Creech Cell: 780-218-4301 Adam visits with lots of customers all year and is on the phone sale week and sale day.